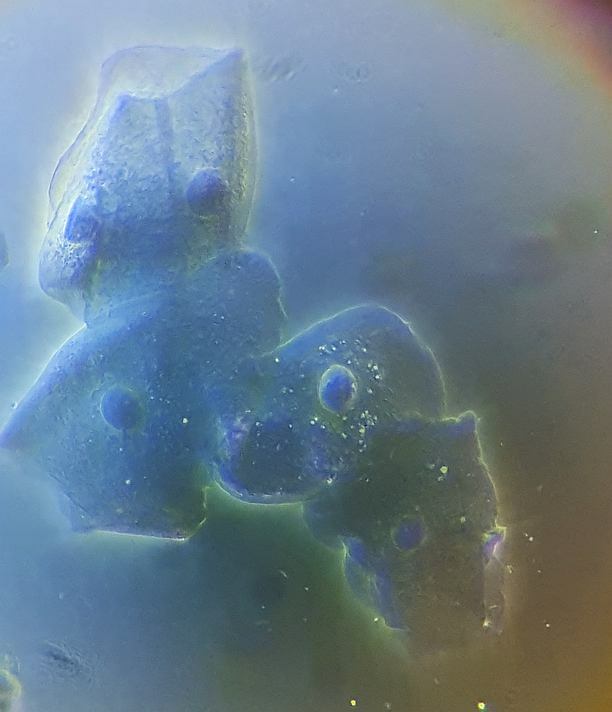 www.photomacrography.net :: View topic - Condenserless microscopy. Posted: Tue Feb 13, 2018 6:10 am Post subject: Condenserless microscopy. 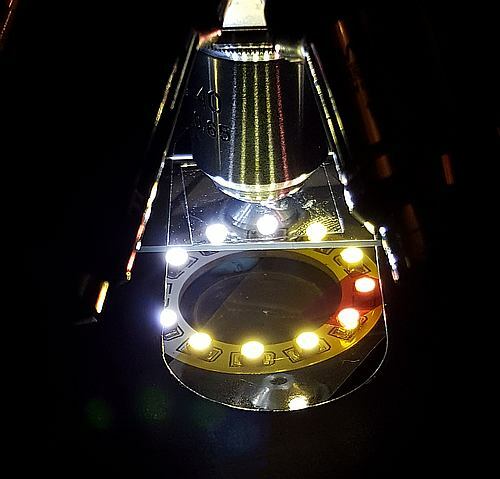 Since the advent of newer, powerful and cool running LED’s, the reason for using condensers is lessened and it has opened us up to direct illumination techniques. With direct lighting there’s no need to worry about Kohler, collimation, phase condensers, aplanatics and all that. I have a great level of control and almost infinite variability, plus lots of fun and it's very cheap. I got the idea from a couple of sources, one was the long discontinued Zeiss Lucigen condenser, the other was a paper on using ring lighting for phase contrast as opposed to fixed annuli. These sorces convinced me there must be merit to these alternative approaches, and a lot more flexibility. So here we go. 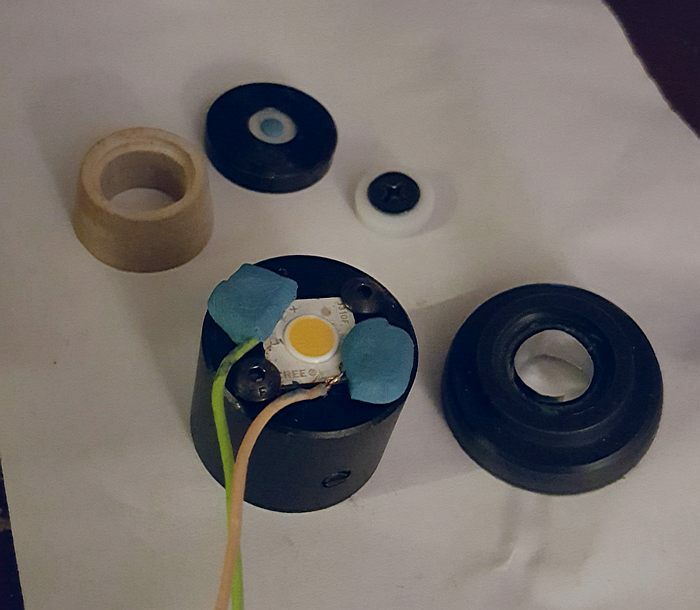 The lights I'm using are a 40mm angel eye with 12 led’s and a Cree CXA 1310 High Density LED with a small disk of 1/16" thick translucent White Acrylic Plexiglass in a home made holder. First off, the Angel eyes mounted below the stage on my zeiss. These are extremely cheap 12V rings aimed at the auto world. I have mine hooked to a variable transformer to adjust the brightness. The light is fixed to a plate and sits on the condenser holder where it can be adjusted up or down to suit the application and lens NA, and manually moved to center it. As it's a ring of LED's it can be used in 3 primary ways, Phase contrast, COL (circular oblique lighting) and darkfield. In these roles it gives a very sharply defined image but is limited to relatively thin samples due to massive flaring on out of focus objects. On items like onion skin, diatoms, cheek cells and the like, it works great. Pond samples with relative depth... not so much. One thing I noticed straight away is its ability to pick out diatom frustules I don't normally see with more convential lighting. I think the 12 discrete bright LEDs are highlighting the structures in a way that more homogenous lighting cannot. It's not better resolution, more like higher definition. It certainly shows detail more readily, and due to the ring being 40mm across it's very easy to make Rheinberg filters for it as shown in the picture. In use, raising and lowering will determine the light ring size at the objective backplane, you can use COL upto the full NA of a .65 objective, maybe higher. You can adjust it to match most Phase objectives, and raised high enough, the light ring will fall outside the backplane and that will give you darkfield. Next, the Cree CXA 1310 is a 9mm high density array that runs 18 Volts. I'm using an old laptop brick to power it and run it through a dimmer. This is capable of over 1,000 lumens, so it gets plenty bright. I made a small spacer about 10mm tall and cut a piece of translucent white acrylic to fit so essentially it's the equivalent of a Lucigen. The way the Lucigen works is that the light hits the translucent acrylic (or opal glass) and forms a uniform non-directional light source. Because it has no focal point, it is simply moved up and down to suit whatever lens you're using, even oil objectives (if sealed, it can be oiled to the slide bottom). I haven't noticed any image degradation from a standard condenser and it's much simpler in operation, no field iris, no condenser iris, no Kohler, no focussing. In the picture you can see the setup, a block of aluminum as a heatsink, the LED, spacer and acrylic with a stop in the middle. This gives COL lighting as well as Oblique. Remove the stop and you have standard brightfield. Add a piece of polarizer film and you have polar etc. This setup works with all objectives I have from 4x up. Adding whatever shape oblique stops on top of the acrylic will do the same as the equivalent stops place in a normal condenser filter tray. Moving the whole assembly off-axis will give oblique lighting. If the acrylic disc is too large and/or too high, you'll get glare like a condenser iris that's open too far. The original Lucigen disk is 8mm diameter. Mine is a little larger because I'm still experimenting with it and I'm also using mine for bright through COL through to darkfield, which requires a larger disk. In use it works similarly to the angel eye but is much more forgiving as the light is smooth and even. It doesn't have quite the same level of definition but is applicable to a much wider range of subject matter and is my everyday light. Overall I'm very happy with these setups. I've swapped them out for the Zeiss condenser often but always return to the direct illumination. 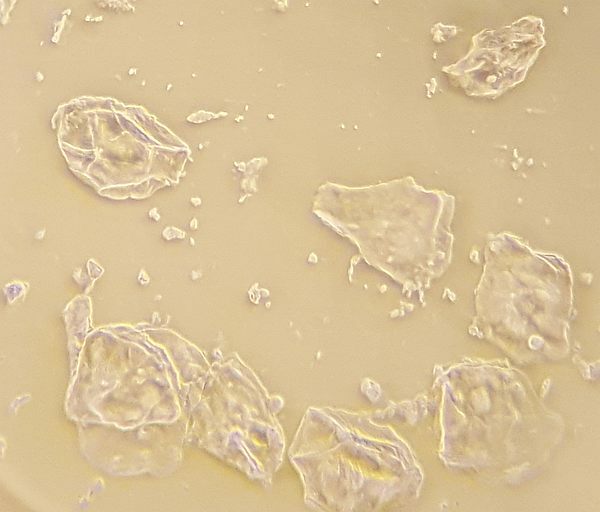 Below are some poor pictures of cheek cells with the systems at varying heights to show the effects. All pictures taken with a cell phone. They all look much better in real life than my ugly pics I hope this gives some food for thought. Any questions? Fire away, I have my flameproof suit on! Posted: Tue Feb 13, 2018 11:09 am Post subject: Re: Condenserless microscopy. Very nice work, Gary. Thank you for sharing. Would it be difficult for you to post an exploded view of your LED light's construction? As it's a ring of LED's it can be used in 3 primary ways, Phase contrast, COL (circular oblique lighting) and darkfield. In these roles it gives a very sharply defined image but is limited to relatively thin samples due to massive flaring on out of focus objects. 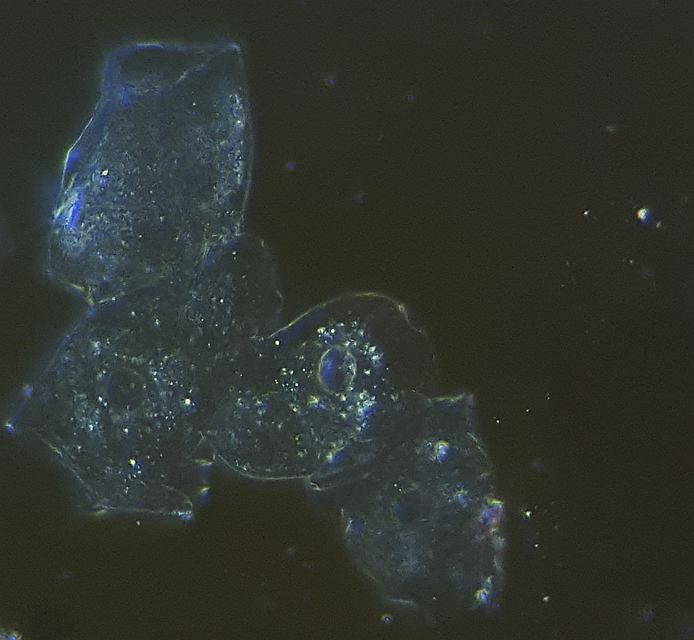 On items like onion skin, diatoms, cheek cells and the like, it works great. Pond samples with relative depth... not so much. This is likely true for ring lights (Leitz Heine, Reichert Polyphos or Zeiss Pancratic system). I am guessing the wider the illumination ring (by reducing opaque stop size while keeping illumination cone size), the less contrast enhancement by shadows. 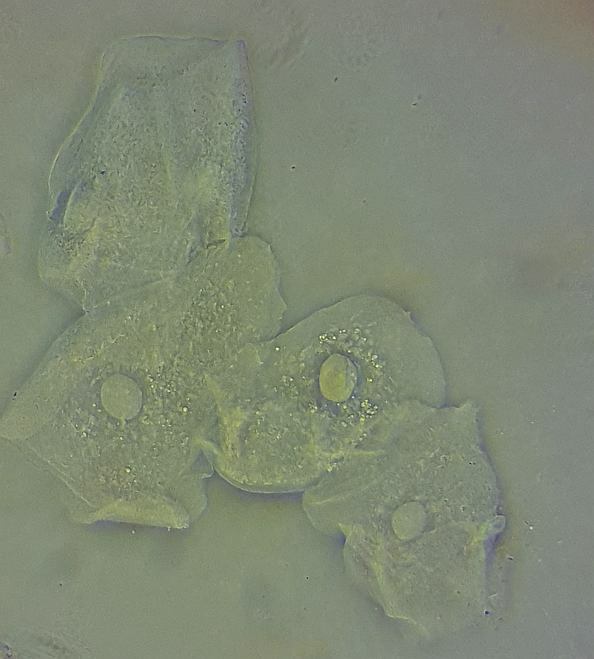 Such shadows are great for thin diatoms, but terrible for thick protists. This may occur with some subjects, but I am not sure it is true for most subjects. To be safe, I may still prefer homogenous lighting and move filter, light or subject. Does Lucigen design or your particular implementation here waste a bit of light? 1000 lumens LED is good power, but are you using most of its power, like how a proper microscope illumination system does? The reason why I asked is, your "COL high" and "darkfield" images seem quite dark (your other images look nice-excellent). How do they look with longer exposure? Have you tried a diatom as target? 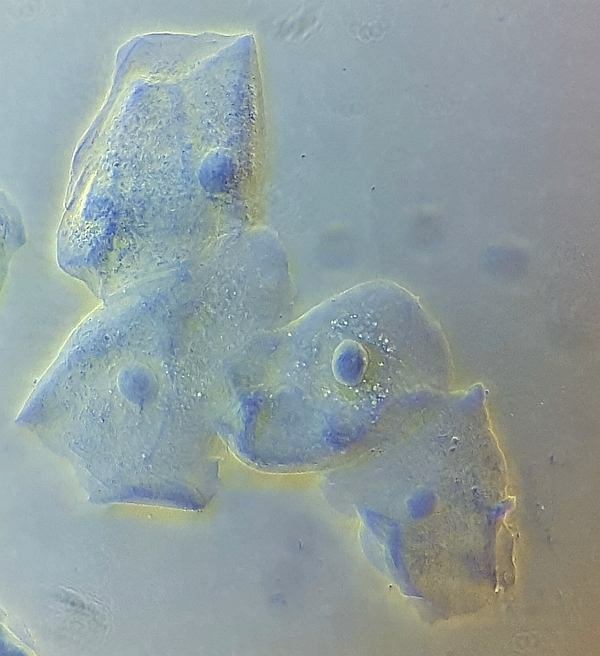 I am not familiar with how cheek cells look under darkfield or COL high, but I know very well how test diatoms look like. When I tried DIY COL high and DIY darkfield at 40x NA 0.65 with an Abbe condenser, I found that it is not easy to adjust illumination effects. That is where dedicated ring light (internal reflecting) condensers start to shine; they are also more light efficient than DIY methods at NA 0.65 and up. Ring lighting in most setups like those you listed still produce a contiguous smooth circle of light, as do most diy COL lights. The Angel eye led's are all separated with a large gap, so frustules are hit with 12 separate light sources effectively which seem to better highlight details. 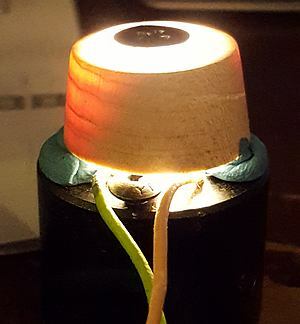 Yes, with the Angel eye thicker specimens become a giant mess, with the Cree lucigen light, it is a homogenous circle and much easier for general purpose use. The nice thing about it is that a stop of any size can be made with small blobs of Blu-Tac, for brightfield just remove it. It does lose a good chunk of light going through the acrylic but it's still nice and bright. The darkfield is just confusing the phones exposure settings and it's not really as dark as it looks in the picture. With the diy Lucigen it's not too difficult to get the look you want. With a Abbe condenser it's normally necessary to have a full size bundle of parallel light going into the condenser for these things to work optimally and most don't have their light set up to do that well, generally due to less than optimal design. Sadly I don't have any diatom test subjects. The only ones I find around here are very small and don't photograph well. here's the pic of the parts use for the Lucigen. There are different height spacers and different diffuser styles to experiment. It's pretty simple and using blu-tac keeps things easy to swap around. Nice, it looks like he read the same article as me on phase contrast. The small 40mm ring light I use from ebay makes things simpler to experiment with as I was using it with my Wild 40/.75 fluotar no problems, also a B&L 45/.80 and it can go high enough under the stage of the Zeiss to go completely darkfield and because it's 12V it can be put through a standard wall 12V psu with a $4 ebay dimmer. The nasty artefacts you get on out of focus objects can be mitigated to some degree by placing a ring of semi transparent film over the Led's which spreads the harsh light points into something smoother and less visually obtrusive. Any 12V psu you have around the house, most people seem to have a few spare. 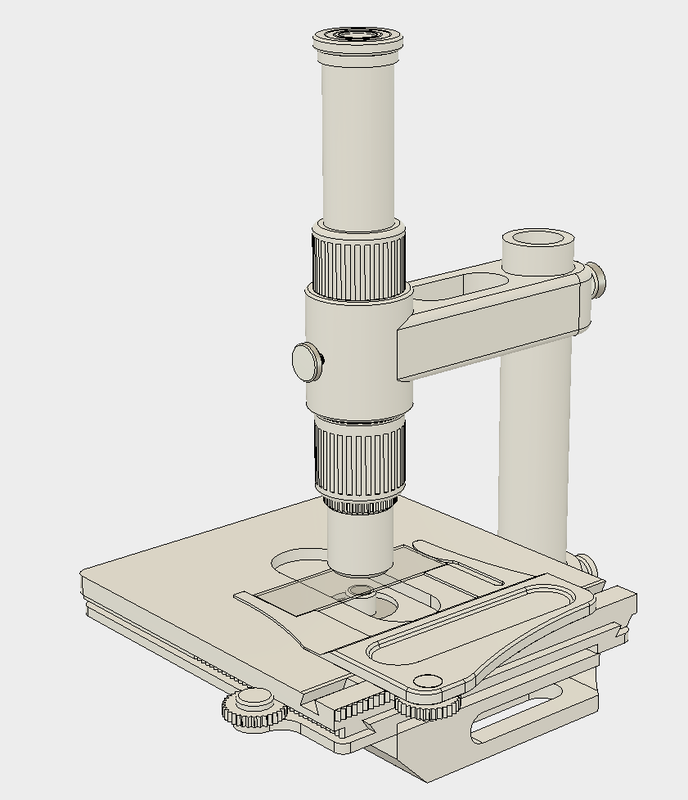 Another application for condenserless microscopy is portable field microscopy. Removing condenser will shrink size, height and weight (about 1lb) of microscope. In that case, LEDs should be powered by batteries. 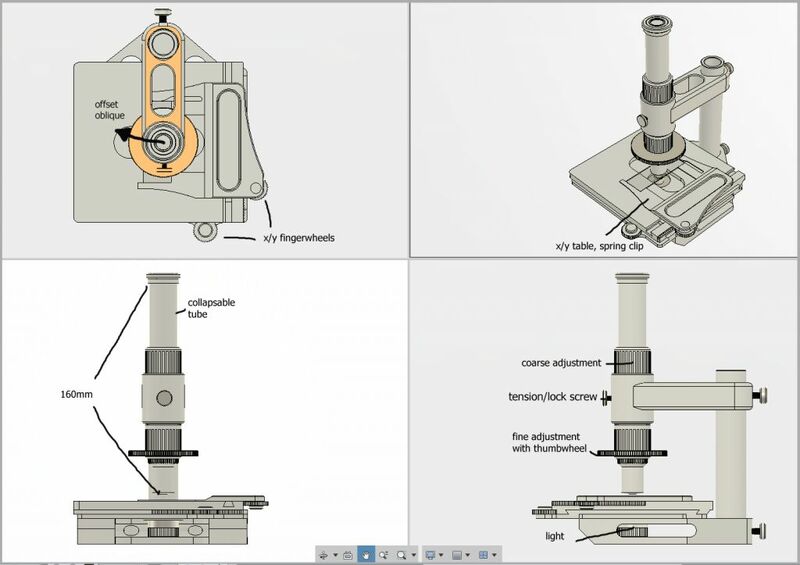 If we can get a very light weight, but rigid and precise focus drive, then portable microscope at 400-450x visual magnification would be possible. That is a big "if" though, as DIY solution using regular RMS objectives may have a hard time getting to less than 4lbs. At least I have not found a solution. I was wondering if I could come up with a simple design that would work for portable use of 20x to 500x and came up with this last night. It's a simple 160mm tube design that can be made from ABS, Delrin and aluminium. The eyetube can collapse down into the body and 2 screws lets it split into 3 small pieces. 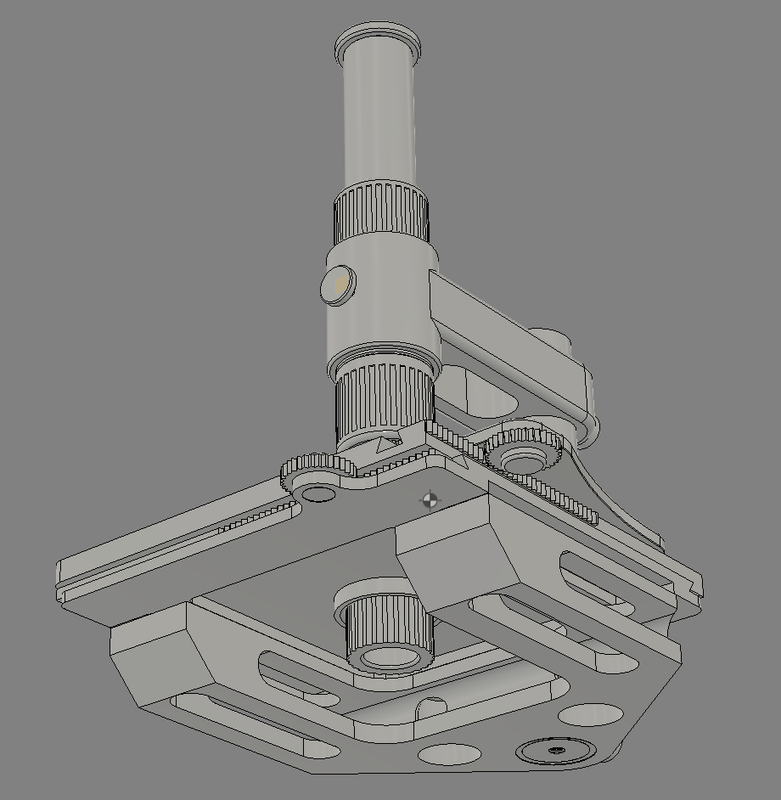 I designed it with a tripod mount at the base of the upright arm so it can be used at any angle. The stage is fully adjustable. Focus is 2 part, the upper grip turns a helix/ball slot for coarse focus and the lower grip turns a fine thread, with any objective, old 33 standard to DIN in size. 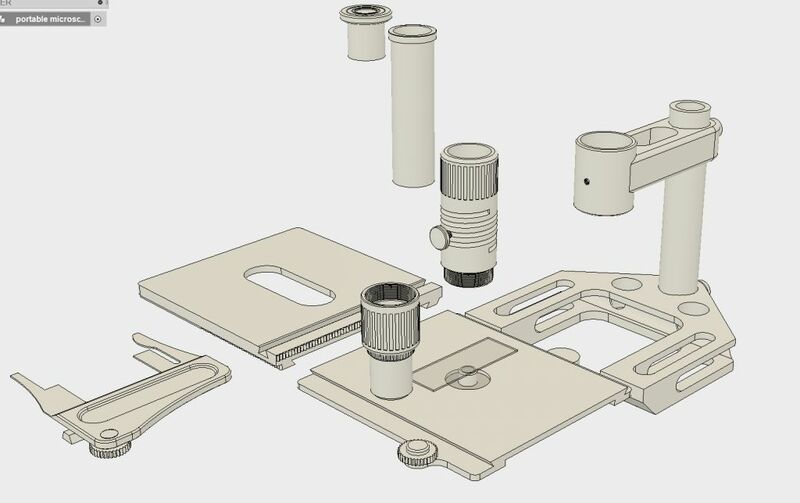 I can dream though.. it may be 3d printable but the mechanism movements might be a bit lumpy. I just counted up the assembly. Excluding the optics and light, 13 parts, 3 screws and one ball bearing! Beautiful design! I want one! Yes, the fine focus is what matters there.